Judge Lesa Gelb of the Luzerne County Court of Common Pleas recently handed down a pair of Orders on June 20, 2012 each separately dealing with a defendant’s Motion to Sever the trial of the tort and UIM claims in two different post-Koken litigation matters. Judge Gelb refused to sever the claims for trial in each of the cases. In two unrelated cases that were argued before Judge Gelb - Loefflad v Nauks & Allstate Fire & Casualty Ins. Co., No. 8673 of 2010 (C.P. Luz. Co. June 20, 2012) and Price v Price, Auto Glass Unlimited & State Farm, No. 13625 of 2010(C.P. Luz. Co. June 20, 2012) - the tortfeasor defendant had filed a Motion for Severance of the tort and UIM claims for trial. Defense counsel in each case essentially argued that the tortfeasors would be prejudiced by the introduction of evidence of insurance issues at trial and that severance was necessary to avoid this prejudice. Plaintiffs' counsel, which included Attorney Richard A. Russo of the Wilkes-Barre, PA law firm of Rosenn, Jenkins & Greenwald in the Loefflad case and Attorney Neil T. O'Donnell of the Kingston, PA O'Donnell Law Office in the Price case, essentially argued that any evidence of insurance would not run afoul of Pa.R.E. 411 as it would not be offered to prove that the tortfeasor was liable. Instead, it would be offered against the UIM carrier to prove the UIM claim, and the court could avoid any prejudice or confusion by artfully drafted instructions identifying the parties and their relationship to and involvement in the controversy. Plaintiffs' counsel in each case also reportedly both pointed out to the Court that State Farm, who was the liability carrier in Loefflad and both the liability and UIM carrier in Price, specifically mandated in its policies that the tortfeasor must be included in a lawsuit against State Farm seeking UIM benefits, and that the State Farm policy language also required that a judgment be secured against the tortfeasor in that action. 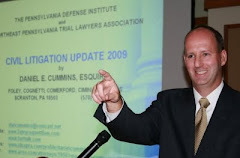 As noted above, the motions to bifurcate the claims for trial were denied by the court in both of these cases, which are apparently decisions of first impression in Luzerne County. Anyone desiring a copy of the one-line Orders issued by Judge Gelb in the Loefflad case and/or the Price case may contact me at dancummins@comcast.net. I note the only other decision that I have come across so far on the issues presented by a motion to bifurcate post-Koken liability and UIM claims is the Purta v. Blower and Erie Ins. Exch., No. 2010-C-2515 (C.P. Lehigh Co. Sept. 20, 2011 Reibman, J.) decision out of Lehigh County in which the court granted the defendant's motion for bifurcation, in part, to avoid the prejudice that could be brought on by the introduction of insurance issues at trial. To view the Tort Talk write-up on the Purta case, click this LINK. It appears that we now have the beginnings of another split of authority on another issue of importance in Post-Koken litigation.